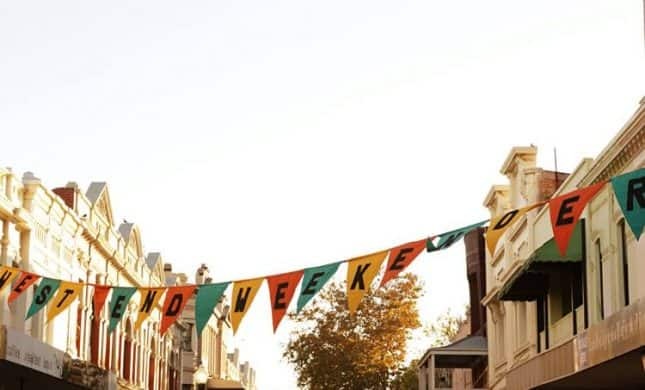 As part of the Fremantle International Street Arts Festival, historic High Street will come alive with artisan markets, live art, international food stalls, street beer gardens and a chill out zone with fun activities for the kids! Indulge your senses as DJ Veronica Lily joins forces with the King Fez Band to give you a mix of soul, blues, swing and 60’s. There will be dancing in the street!! SATURDAY ONLY See what acting is all about with the National Institute of Dramatic Art (NIDA) holding exciting 50 minute sessions throughout the day to help you explore improvisation, character and scene-work as you take your first steps on your creative journey! For more information head to: https://www.facebook.com/events/167399644145297/ Full program details COMING SOON so keep your eyes out for more information on the exciting activities High Street has to offer this Easter weekend! Proudly presented by The University of Notre Dame Australia and supported by Fremantle Now.